Hi! My name is Tiffany VanderSchaaff, and I’m the blogger, professional organizer, and social media manager behind Calyx and Corolla. I used to think I had excellent organization and time management skills…. Until I got married, had kids, and started working at home! Building a business at home alongside managing a household and raising a family tested ALL my skills, especially time management and organization (and patience when my kiddos were younger…and even sometimes now that they’re teenagers). My office was doing double, triple, and quadruple duty as I attempted to manage the many moving pieces involved with my family, home, and business. I felt like I had no time. I was frazzled and harried, and wasn’t doing anything well, not as a wife, a mom, a home manager, or a business owner. I was so stressed and overwhelmed that I quit before my business was even off the ground. But a year later that restlessness to build something of my own returned. I tried again, only to fail AGAIN. I quit so many times that I’ve lost count. But as my oldest daughter started her college search, we realized that we were woefully unprepared to handle the financial burden of her higher education. I HAD to make a go of a business that I could run at home or get an outside job and sacrifice being home when my kids got out of school, were sick, or had a day off. I refused to entertain that second option. I wanted to keep my family priority ONE. To help ensure success this time around, I began the painful process of analyzing my previous failures. I realized that I needed to relearn the organization and time management skills I possessed before marriage, kids, and chaos reigned. I read, studied, implemented, and tweaked different organization and time management skills and techniques. And as those skills slowly grew, so did my business. The income from my fledgling business helped pay for my daughter’s college education and soon, it will pay for my son’s. I’m excited to share with you the tips, tricks, and techniques I’ve learned, so that you can put your family first, contribute to your family’s financial goals, and realize your dreams of owning a successful business!Over the past 15 years , I’ve honed my organization and time management skills while running various businesses at home, and I’m sharing all of my tips, tricks, and secrets with you! I’m a blogger, social media manager, and professional organizer. Sounds like a strange combo, but those skills actually mesh incredibly well. I’m passionate about helping time-strapped creative business owners utilize the power of organization and time management to grow their businesses! Want to learn more about our services or work with us? We’d love to be a member of your business team! Click HERE to learn about our services. Or email us at info@calynxcorolla.com to get started right away! If you’re interested in learning more about me and how I learned my mad organizing skills, please visit the About Page. If you’re wondering how Calyx & Corolla got its name, click here. I live on the plains of Colorado with my husband and three kids. I’m obsessed with my two darling dachshunds and office supplies. I enjoy bird watching, challenging my kids to video game tournaments (and losing every time), decorating our home and completing DIY projects, relaxing in the backyard reading a good book, and gardening. Ready to organize your business but not sure where to start? 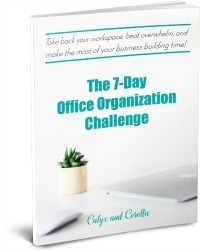 The best first step is to join the 7-Day Office Organization Challenge! Each day for 7 days, we’ll tackle one office trouble spot, get it decluttered and organized, and create processes (habits & routines) to KEEP it that way! Download the 7-Day Challenge Workbook and start the challenges right away and work through each one at your own pace. Or watch your email inbox for the first challenge email, then check your inbox each day for the next challenge. 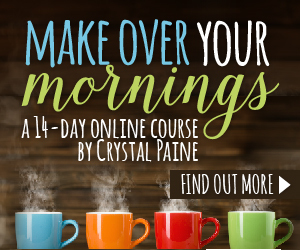 It’s time to take back your work space, beat overwhelm, and make the most of your business building time!